After the iPad Air went on sale last Friday, analyst Brian White of Cantor Fitzgerald polled 106 buyers at Apple retail stores in New York City. Among those early adopters, 73 percent were upgrading from older iPad models, while the remaining customers were new to Apple's iPad platform. The biggest portion of iPad Air upgraders were those who previously owned an iPad 2, representing 31 percent of respondents. Another 18 percent of those polled were transitioning from the third-generation iPad, while 16 percent had owned the first-generation iPad. White's poll also found that most day-one buyers —64 percent— preferred the white and silver model over space gray. The entry-level 16-gigabyte capacity also proved to be most popular, with 60 percent of respondents indicating it was their purchase. Interestingly, White's survey also found strong demand for Apple's recently discounted first-generation iPad mini, which is now available for $299. Separately, mobile analytics research firm Fiksu has been tracking online usage data of the iPad Air since it went on sale last Friday. They found that usage of the iPad Air is significantly higher than that of the fourth-generation iPad after the same amount of time last year. After three days of availability, the iPad Air represents 0.74 percent of all active iPads tracked by Fiksu. 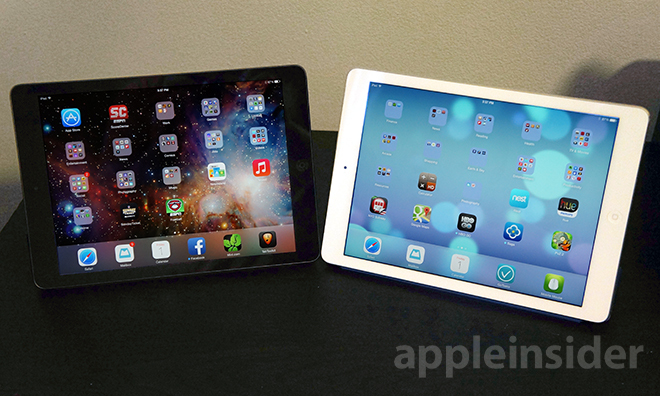 In contrast, at the same point last year, the fourth-generation iPad was at just 0.15 percent. The data comes paints a picture of a launch weekend from which Apple has apparently declined to give specific sales data. In contrast, last year Apple debuted both the iPad mini and fourth-generation iPad on the same day, and announced they both reached 3 million units with both devices in their first three days. Apple's silence likely stems from the fact that this year the iPad Air launched alone, while the second-generation iPad mini with Retina display is set to become available later this month. The company elects to not detail sales figures on specific product models, citing competitive reasons.